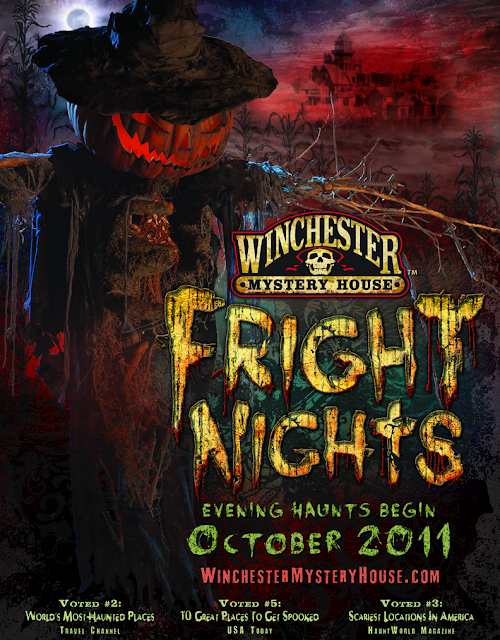 The San Jose Blog: Winchester Mystery House Fright Nights!!! Winchester Mystery House Fright Nights!!! It might be a little bit early to start promoting Halloween events, but I think this one is extraordinary and worth booking as soon as possible before tickets sell out. Each October I usually go to every haunted attraction within 50 miles of Silicon Valley, and I can tell you that I have never been more excited about a Halloween event than when I found out about this one. The Winchester Mystery House is San Jose's top tourist attraction and is regarded as one of the spookiest places in the world. For a while now they have been turning off the lights and doing flashlight tours of the mansion during the weekends in October, but this year they are taking it up a substantial notch. For the first time ever, they are adding a full blown 15min interactive haunted maze called the Curse of Sarah Winchester! I'm excited not only because I think it is the best location anywhere in the Bay Area for a haunted maze, but also because of the people working on the project. The producer is Brett Tomberlin, who has worked on various movie and TV productions, as well as on multiple Disneyland attractions (and is also producing a feature film based on the Winchester Mystery House). The show director has performed roles at both Disney and Universal Studios. 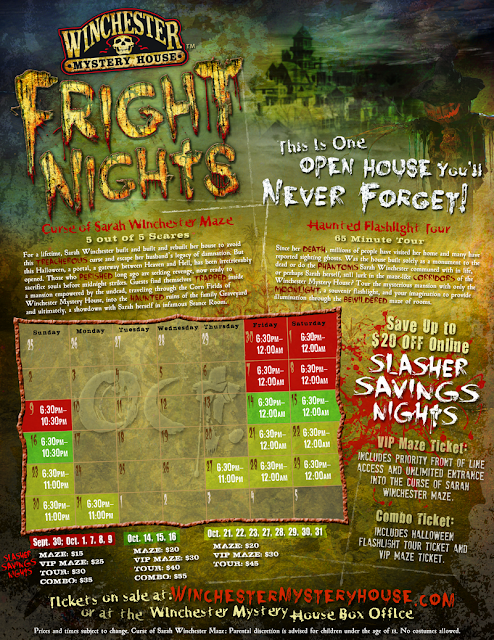 The production designer has 15 years of experience of building well-reviewed haunted attractions. This his is going to be very professionally done with a seasoned team and I can't wait to see the results. Fore more information and tickets, click here!